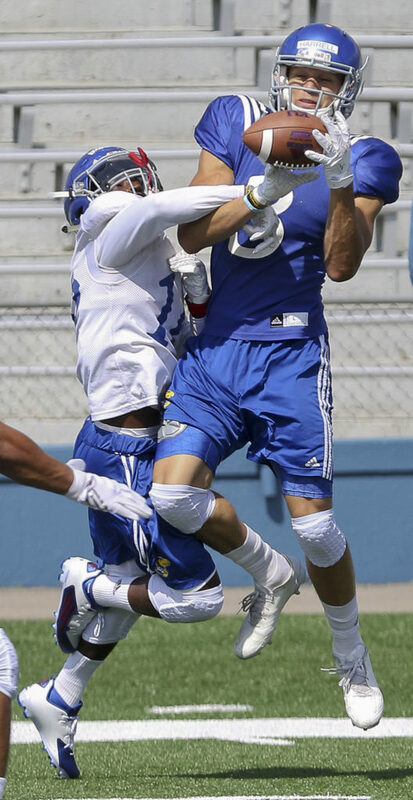 FILE — Kansas receiver Chase Harrell, right, tries to hold on to a pass as defensive back Kyle Mayberry pulls down on his arm during KU's Fan Appreciation Day practice on Saturday, August 20, 2016, at Memorial Stadium. 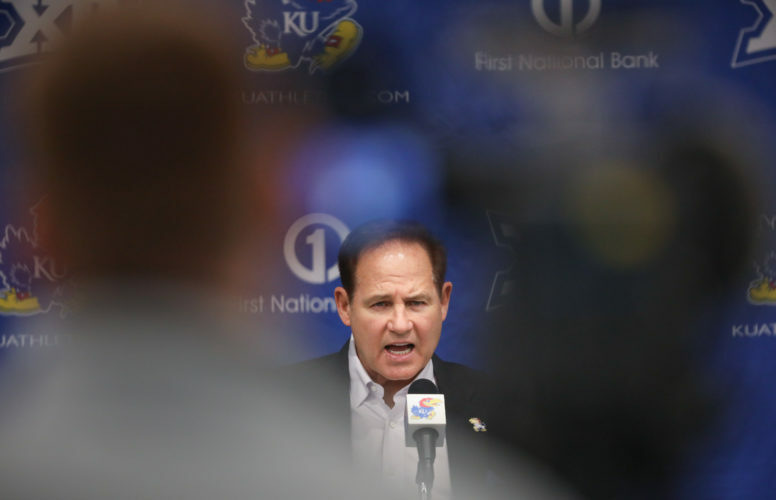 When head coach David Beaty and his assistants met ahead of spring football to discuss the areas where they needed to identify players who can help Kansas in 2017, it wasn’t hard to spot the position with the biggest question marks. 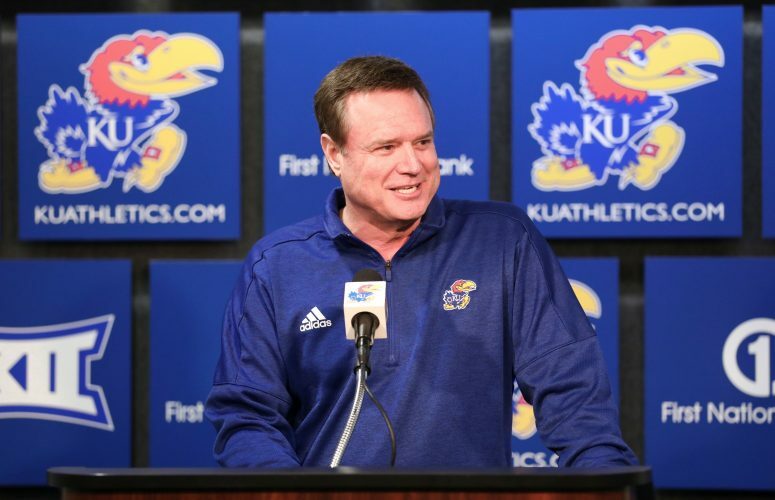 KU’s coaches want to find their replacements and they don’t want to wait until August to do so. Beaty described the staff’s search for two new starting corners as a great challenge. He wants to see this spring who among sophomores Hasan Defense, Kyle Mayberry, Julian Chandler and Justin Williams and redshirt freshman Shola Ayinde can prove himself worthy of a starting job. 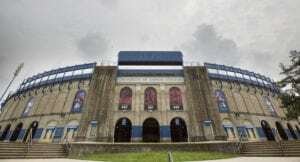 In a football utopia, Beaty and his aides would have every position battle resolved by the end of KU’s 15-practice schedule, which wraps up April 21. The third-year head coach, though, wasn’t in a position to claim that would be realistic. Defense, listed at 5-foot-11, 180 pounds, arrived in Lawrence as a mid-year transfer after playing one season at Kilgore College (Texas). 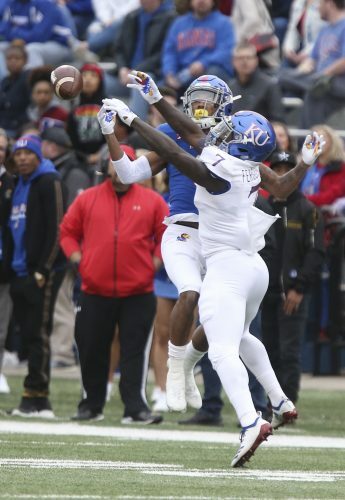 His apt last name tends to be the first one brought up this spring when discussions turn to KU’s situation at cornerback. Kansas freshman Bryce Torneden, left, and freshman Shola Ayinde (15) work on kick-off coverage during practice at Memorial Stadium on Friday, Aug. 12, 2016. 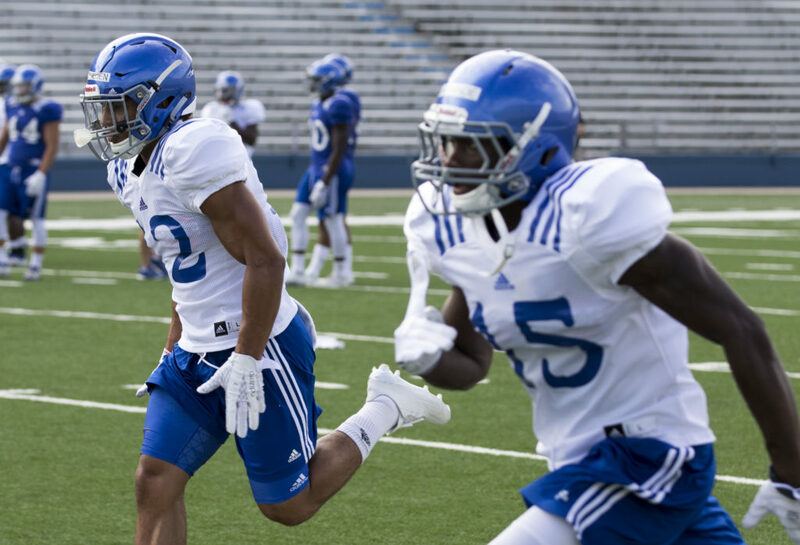 On Tuesday, following the team’s fourth practice, Beaty remained impressed with Defense, who broke up 14 passes and delivered five interceptions playing as a freshman in 2016, at the junior college level. 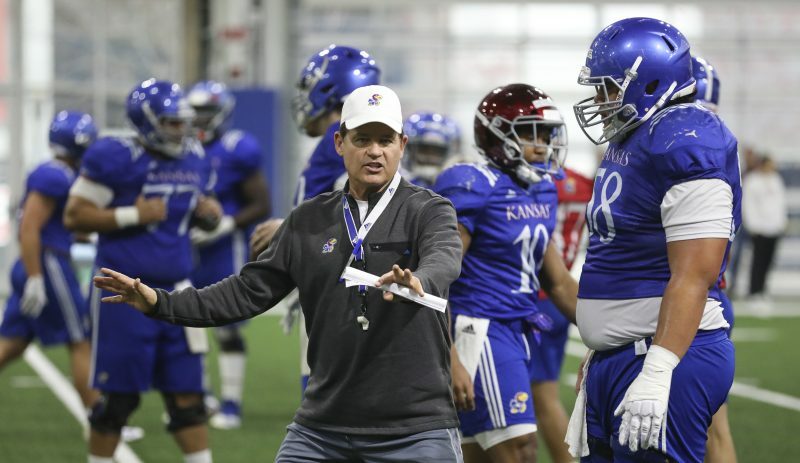 KU assistant head coach and defensive coordinator Clint Bowen, too, thinks Defense possesses the appropriate skill set to play corner in the Big 12. Thus far at practices, Mayberry and Chandler have taken a lot of reps at cornerback, as well. Beaty said KU hopes to get Ayinde and Williams more involved, but both suffered anterior cruciate ligament injuries in 2016. Beaty, Bowen and cornerbacks coach Kenny Perry will spend plenty of time this spring evaluating cornerbacks carefully. Ultimately, Bowen added, the coaches need to determine what they can trust Defense, Mayberry, Chandler, Williams and Ayinde to do on the field. Other cornerbacks listed on the roster include senior Derrick Neal, who plays more of a nickelback role, junior Shakial Taylor, sophomore DeAnte Ford and redshirt freshman Ian Peterson. Class of 2017 signee Robert Topps III, from Chicago, will arrive in the summer. For the corners currently being scrutinized, the skills they show in the weeks to come almost certainly will shape how their coaches scheme within the defense as a whole.